Ask any new mother how she’s feeling and variations of “exhausted” will likely be uttered from her mouth. If a new mama cow could talk, her answer might be the exact same, especially if she is a 2- or 3-year-old that has just delivered her first or second calf into the herd, while she’s still growing and developing herself. That’s not all this multi-tasking mama is doing; she’s also lactating, caring for a calf and trying to prepare herself for the upcoming breeding season. Producers put a lot of pressure on their cows. While they continue to grow and mature themselves, they are also growing a calf in their womb and hopefully generating an ample supply of high-quality colostrum. On calving day, you expect them to deliver a healthy, vigorous calf unassisted, and get that calf up and nursing. Then, during peak lactation when nutrient needs are the highest, you also expect them to maintain their body condition, all while continuing to grow and being ready to rebreed 45-60 days after their calf is born. “These are some unrealistic expectations we put on a cow in a very short amount of time, about 120 to 150 days of her life,” said Lindsey Grimes-Hall, Nutrition and Field Sales Manager for BioZyme ® Inc. “Our cattle are genetically superior to what they were 50, 40, even 20 years ago so our nutrient requirements are also increased because they are genetically capable of more. The hierarchy of nutrient partitioning applies to all vitamins, minerals, protein and energy according to Grimes-Hall, and a large portion of nutrients that an animal consumes each day goes toward maintenance. Next, the remaining nutrients are used for the growth of the actual animal if they have not yet met maturity. If there are still a surplus of nutrients, these can be allotted for fetal growth and development. Finally, any remaining nutrients are then used for milk production, reproduction and weight gain – all critical to that younger cow that has just given birth. Weather has a huge impact on basic maintenance requirements. When it is really cold, an animal is going to have to expend more energy to keep herself warm. Nutrient requirements tend to increase 10-25% in extremely cold weather, when many producers do calve. To prepare your cows for this nutritionally challenging time of their production cycle, Grimes-Hall suggests making sure the younger females are on a more positive plane of nutrition and exceeding some of their nutrient requirements. As they enter the last 30-45 days of gestation, an extra boost of protein and energy will help them with colostrum production, as well as their own maintenance. She warns not to push the cows too hard to get them overly fleshy because that could lead to bigger calves and calving difficulties. Additional nutrition for your cows will depend on the region you live in and the resources available to you. If you were able to make plentiful high-quality hay, you might be able to supplement with additional forage. For others, adding grain to the diet might be necessary. “That’s the beauty of the beef industry. We can do so many different things to achieve the same result all across the country,” she said. One sure way to get added nutrients into your herd’s diet while maximizing the nutritional value of their feed, is to feed with VitaFerm® Concept•Aid®. Concept•Aid is a line of vitamin and mineral supplements for beef cattle formulated to promote effective, easy breeding when fed 60 days pre-calving through 60 days postbreeding. High concentrations of vitamin E and organic trace minerals, coupled with the Amaferm® advantage, supports quick repair of the reproductive tract and more energy for reproductive success. Additionally, increased nutrient absorption and digestion leads to healthier and heavier calves giving you performance that pays. The mama cow is a busy lady with raising a calf, maintaining her own body condition and getting reproductively in-shape for rebreeding. 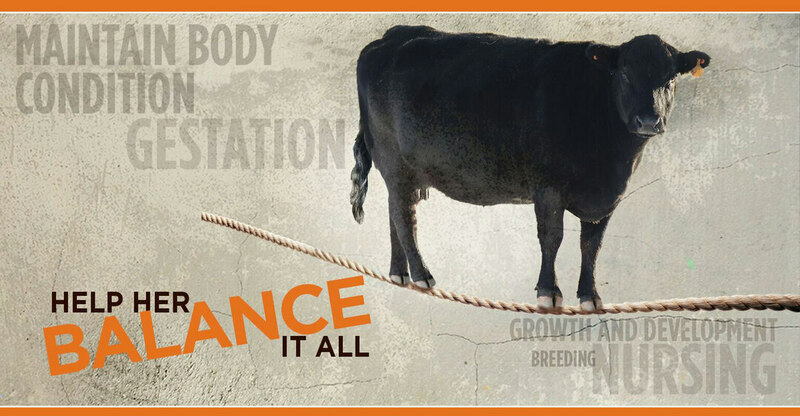 As producers, it’s your priority to make sure she has the nutrients she needs to handle the balancing act required to continue to be a high-performing, profitable part of your herd. Provide the nutrition she needs with VitaFerm® and the Amaferm® advantage.